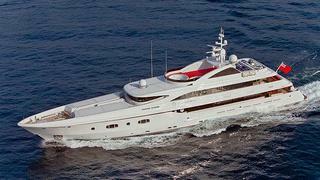 Stuart Larsen at Fraser Yachts asks me to report that the owner of the 55m Turquoise has decided to participate in the Prestige Yacht Auction on April 20th in Antibes and Monaco. To recap, Turquoise was delivered by Turkey’s Proteksan-Turquoise yard in 2011. With naval architecture and styling by Dubois, this steel and aluminium superyacht offers the ultimate in cruising comfort for up to 12 guests. Her exterior combines a purposeful sheer and business-like vertical windscreen with a long, elegant, seagoing bow. With two 1,500hp Caterpillar engines giving a maximum speed of 17 knots, and a 3,500-mile range at 14 knots, this is a yacht built for going places. A finalist at the 2012 World Superyacht Awards, Turquoise is featured in the 25th anniversary Superyachts book.